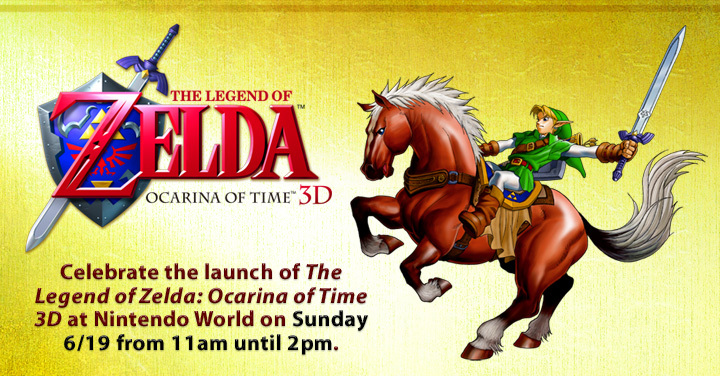 Nintendo is throwing a launch party for Ocarina of Time 3D at Nintendo World in New York City. Users who registered with Club Nintendo (and live within a certain proximity to Nintendo World) will see this message inviting them to a celebration this Sunday. Nintendo is encouraging fans to dress up as their favorite Legend of Zelda character, create Legend of Zelda based Miis on their 3DS systems, participate in a Gold Skulltula scavenger hunt, play classic Zelda games, and “more…” We’ll be sure to tell you what the “more…” is all about because we will be there this Sunday! Head on past the break to see the rest of the email. I know I’ll be picking up Ocarina of Time 3D (and attending the festivities in New York City) this Sunday. Are you getting Ocarina of Time 3D this Sunday or will you wait? Let us know in the comments!